Fr Kevin Mogg AM has spent over five decades as a leader in Catholic Social Services. He has been an inspiring parish leader for over six decades, an educator, and a prison and youth justice chaplain. For 24 years he also served on the Board of CatholicCare where he continues to serve as Emeritus Board member - but it doesn’t stop there. Fr Kevin was the founder of Catholic Social Services Victoria and was a member of the Australian Catholic Social Justice Council for 15 years. His dedication to the Church and towards creating a just society has been a lifelong mission, and he has encouraged many others to take part in this mission, too. On Thursday 31 January, together with friends, family and colleagues, we celebrated the launch of Fr Kevin’s book “An Enabling Life” which captures the journey of his ministry and vision in an insightful and engaging account. Author Anne Tuohey - who first met Fr Kevin when she started work at Catholic Social Services Victoria - worked with him to bring this book to life and collate the stories and thoughts that portray his astonishing life’s work. 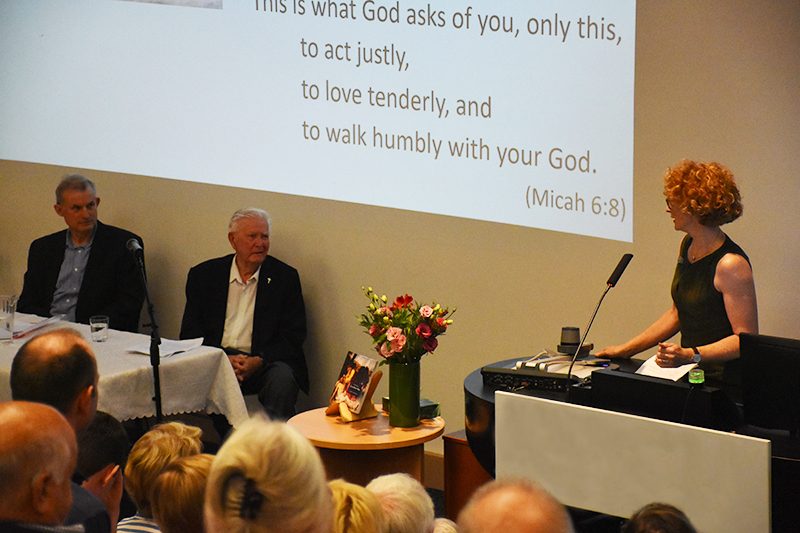 Photo: author Anne Tuohey speaking at Fr Kevin Mogg's "An Enabling Life" book launch. “The recurring theme throughout the book is the way in which Fr Kevin motivated people to contribute their talents for the benefit of others. He empowered many young people to develop leadership skills and a strong sense of community that would serve them well for life,” reads the description on the back cover of “An Enabling Life”. During the book launch yesterday, it was clear that Fr Kevin has developed the most wonderful, strong and meaningful relationships throughout his life. There were people from all walks of life in attendance – all of whom had either had a part in shaping the person Fr Kevin is today, or who had been shaped by his friendship and support throughout their own lives. Judge Michael McInerney, a close friend of Fr Kevin, was invited to officially launch “An Enabling Life” during which he told great stories of the wondrous life Fr Kevin has led. Photos: Michael McInerney speaking (left) and Fr Kevin Mogg (right) speaking at "An Enabling Life" book launch. ‘[He is] an intelligent, determined, loyal and obedient person who has a strong faith and has lived by that faith,” said Michael. He also noted that Fr Kevin was the first state-appointed prison chaplain – and what better person to do this than someone who is so compassionate and slow to condemn. “An Enabling Life” is certainly a ‘labour of love’ as described by the many who were involved in the process of its making. The stories within span decades, and some have even been written by Fr Kevin’s dearest friends and colleagues. If you would like to purchase Fr Kevin’s book “An Enabling Life”, please click here.